JJS Manufacturing offers a complete range of supply chain and manufacturing outsourcing solutions that enable you to spend more time focusing on your core activities, such as: designing new products, marketing, and sales to help grow your business. Long-term partnerships are built on trust and we have been seen by our clients as a ‘safe pair of hands’ since 1983. We work with clients that have a clear outsourcing strategy and understand the true value of relinquishing full control of supply chain, assembly, test and logistics functions. To learn more about the services we offer and how we could support your product through its entire lifecycle click on one of the numbers below to read more. The right design support can improve your product’s viability throughout its lifecycle. The success of any New Product Introduction/NPI programme relies on effective selection of all components, materials and suppliers. JJS Manufacturing has design for procurement expertise across electrical, electronic, mechanical and electro-mechanical disciplines. And with highly experienced purchasing and engineering groups, plus a global network of suppliers, we are ideally placed to advise and support customers at the critical design stage. Getting this right will have an important impact on the products viability throughout its lifecycle. When selecting an electronics manufacturing services (EMS) partner OEMs should seek one with demonstrably outstanding electronics supply chain management (SCM) capabilities. JJS manufacturing recognises the critical importance of this and has experienced procurement, SCM and logistics personnel resources in each of its three facilities in the UK and Czech Republic. Supported, where appropriate by JJS Manufacturing’s engineering group, our procurement, supply chain and logistics teams have the expertise to identify sourcing options based on the specific needs of each product and customer. With product life-cycles becoming shorter each year, especially within the semiconductor market, thousands of components become obsolete and therefore component obsolescence requires continual vigilance. At JJS Manufacturing, we have significant expertise in all aspects of obsolescence management and work closely with key partners to provide up to date and extensive information to customers. With early warning processes in place to identify ‘at-risk’ parts, we can perform obsolescence risk analysis before a part has been discontinued and plan the transition to a replacement device or identify sources of the device that is becoming obsolete as appropriate in each case in conjunction with our customer’s needs. JJS Manufacturing has significant expertise which helps to prevent counterfeit devices making it through to customers’ products. In addition to stringent supplier selection and monitoring, there has been substantial investment in people, equipment and process development to enable us to identify suspect devices. Within the group we have a dedicated component test laboratory providing ‘best in class’ incoming inspection, including X-ray, microscopes, electrical comparators and chemical marking permanency analysis. Our counterfeit avoidance processes are based on the emerging Industry Standard guidelines including IDEA-STD-1010-B, SAE AS5553 and SAE AS6081. At JJS Manufacturing we aim to exceed your expectations in every aspect of our relationship. Supply chain and materials management is clearly a critical element of this. Our efficient sourcing, SCM and logistics not only reduces risk from global supply chains but delivers ongoing significant benefits to our customers. In addition to the world-class supply chain management systems supporting our manufacturing business, JJS offers a standalone material procurement service. Typically between 50%-80% of the cost of a product is material and lead lead-times of between 12-20 weeks are not uncommon. We therefore believe partnering with an EMS company that can apply the appropriate resource, focus and leverage to the supply chain is vital. We have significant experience in the international sourcing market and are the only EMS group in the UK with an entire division dedicated to supply chain management. We have separate commodity groups to cover the procurement of Electronic/Electrical parts and a team of experts responsible for 'drawn' items. Our customers can be sure of achieving a distinct competitive advantage in material procurement. On your behalf, we can acquire high-quality components from manufacturers, or from our global network of screened suppliers. In addition to having access to OEM excess inventory and our European purchasing offices in the UK and Czech Republic, the JJS team works with purchasing offices in the USA and Asia. These facilities, coupled with years of industry experience and our strategic worldwide supplier relationships, enable our purchasing team to scour regional markets effectively. We use different supply chain methodologies depending on the service requirements of our customers. These include kitted material, line side inventory, kanban and many 'hybrid' solutions to ensure a lean approach and on-time, in-full deliveries are met. Electronic component sourcing and purchasing is not solely about securing the best possible price. Your devices must also be of the highest quality, to ensure ongoing productivity. In an age of increasing component counterfeiting, you can rest assured that our sophisticated in-house test laboratory is dedicated to performing stringent component testing and verification. Design for Manufacture (DFM), sometimes called Design for Manufacturability, is the element of the design effort that focusses on producibility to enable the product to be assembled in the most cost effective manner, in a shorter time frame, with superior quality. As most of the product lifecycle costs are committed at design stage, this is clearly a critical stage in the overall product design process. The concept of design for manufacture may be found across most engineering disciplines, but the specific details will clearly vary according to the manufacturing technologies being harnessed. Getting this right will have an important impact on the product’s viability throughout its lifecycle. JJS manufacturing has considerable experience in working with customers at this critical stage to help to ensure that their designs are optimised for the manufacturing processes that will be used downstream and that all factors such as component specifications, dimensional tolerances and the required secondary processes are all taken into account. This approach is applied equally to all manufacturing projects that JJS undertake; i.e. PCB assemblies, box build assemblies, cable harnesses, cabinet integration and electro-mechanical builds. 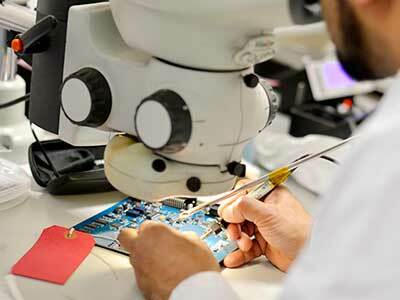 JJS Manufacturing offers PCB assembly services. These complement our expertise in electrical, mechanical and electro-mechanical contract assembly. 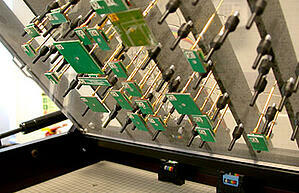 Our PCBA services encompass both through-hole (conventional) and surface mount (SMT) assembly capabilities. 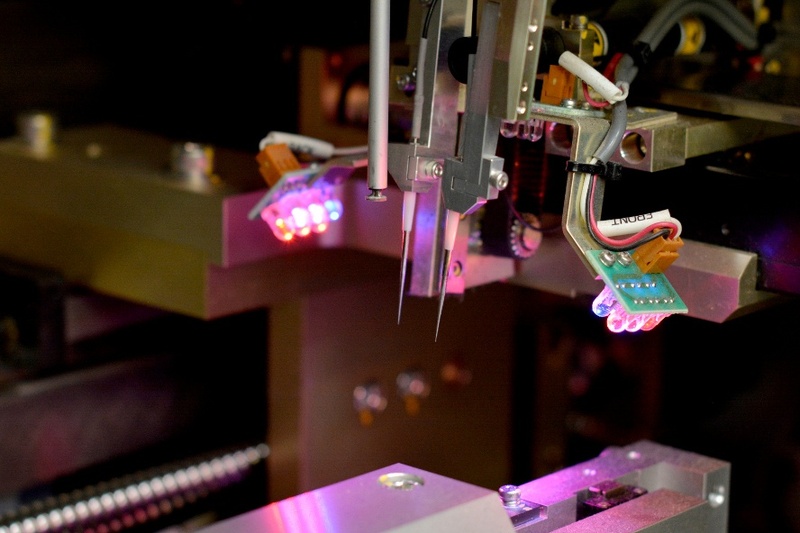 They range from initial production of prototypes (as part of our NPI process), through to the ongoing manufacture of complex, multi-technology PCBAs, in low to medium volumes. We produce both leaded and RoHS compliant products, utilising our five Mycronic surface mount placement machines for SMT assembly. Or, we can form, populate and solder through-hole components to PCBs, either by hand or by using our automatic soldering processes. Our product realisation services take customers through from initial design concepts to full production. Our experienced account managers - along with our engineering, manufacturing and NPI teams - operate in partnership with our customers. We ensure successful new product introductions, on time and within budget. Our NPI team uses a tried and tested approach, to deliver new product introductions. Our use of advanced project management tools, including critical path analysis (along with common sense strategies, such as attention to detail and frequent communication), guides customers through the NPI process. Beginning at the request for quotation (RFQ) stage, the NPI process involves our business development team reviewing the requirements of a product or project and analysing the build pack, data and specifications. When we receive a purchase order, a formal handover process takes place. We then develop a comprehensive project plan. Our team uses detailed documentation, engineering change and reporting control, to ensure continued information integrity. An experienced Account Manager acts as the interface between JJS and our customers. Although, at the same time, we encourage engineer-to-engineer communication. The designated project manager allocates resources and tracks all tasks throughout the NPI process. The result is a seamless transition into manufacturing. Since we first complemented our through-hole (conventional) PCB assembly services, by offering customers the ability to place surface mount (SMT) devices, the technology has progressed. Yet, JJS has invested in people, processes and some of the finest equipment available. This approach has enabled us to deliver to customers' requirements - in terms of flexibility, responsiveness, quality and lead-times. We have five Mycronic surface mount placement machines, configured as three fully integrated lines, for the main production. Each line has a DEK Horizon or 265 printer and a BTU 8 zone oven, connected with automatic conveyors and loaders/unloaders, and an in-line Mirtec AOI system. Also, we have invested in off-line setup facilities, including Agilis feeders, to allow the rapid and accurate changeover of jobs. JJS’s Mycronic placement machines use rapid-change intelligent feeders that can handle components from 01005 resistors to ball grid array (BGA), and fine pitch devices up to 70mm2. All common (and less common) PCB substrate materials are populated, including FR4, flexi, flexi-rigid and metal backed laminates. Pb (if RoHS exempt) and RoHS compliant Pb-free processes are available, both to IPC-A-610 class 2 or 3 as required. Solder paste printing is a critical process, which our DEK automatic printers achieve accurately and consistently. They have built-in, automatic optical inspection for verification, "GridLok" PCB supports, and "ProActiv" for ultra-fine pitch printing. Solder paste reflow is carefully profiled and processed using BTU Pyramax 100A8-zone convection ovens. Our SMT processes are supported by experienced IPC trained technicians, using the latest technology equipment for process set-up and verification. 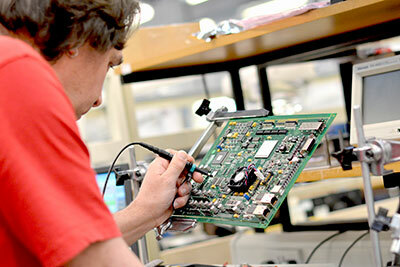 All SMT assemblies are AOI inspected, using in-line and Mirtec AOI systems. 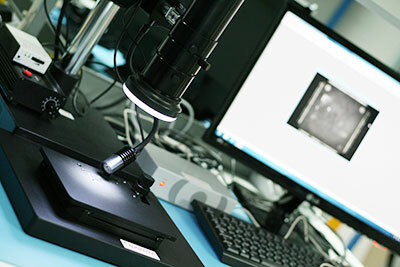 First-off verification is assisted using "Extra Eye" guided inspection, with microscopes, Ersa Scope and X-ray available for fine pitch and BGA inspection. Our materials control facilities include baking ovens and dry storage chambers for correct conditioning and storage of components and assemblies. For modifications and upgrades, two fully equipped fine pitch/BGA re-work stations are available. As well as investing in surface mount technology, JJS Manufacturing also has a fully equipped through-hole facility. We have a skilled workforce of around 40 people, located in our UK and Czech manufacturing facilities. These IPC-A-610 trained operators and technicians have an array of tools and equipment at their disposal, to enable them to perform all the operations required by JJS’s customers. Through-hole components are formed, populated and soldered by hand or automatic soldering processes. Three dedicated Blundell CMS400(LF) wave solder machines offer volume soldering capability for tin-lead and unleaded solder, depending on the RoHS status of the product being assembled. 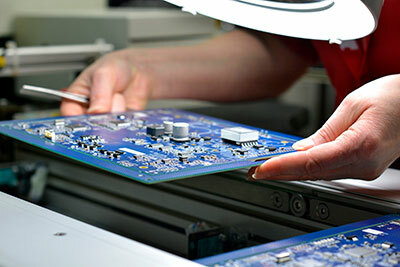 Manual conformal coating and encapsulation services are also available if required, for customers whose products operate in environments where safety, security or humidity are an issue. With both leaded and lead-free soldering, we have no-clean, solvent, ultrasonic and aqueous cleaning processes available. The through-hole process can be completed with functional or Teradyne in-circuit ATE test, before shipment or inclusion in the next build process. JJS is experienced in designing and implementing a variety of test techniques to ensure products are reliable and thoroughly tested – saving customers' time and money downstream by reducing field failures. Every PCBA undergoes full, high-resolution AOI inspection through Mirtec MV-3L machines on each line, with images retained for several months. All boards are traceable by the individual bar code. A rigorous first-off inspection process is performed on each build, complemented by a robust NPI procedure for new products. 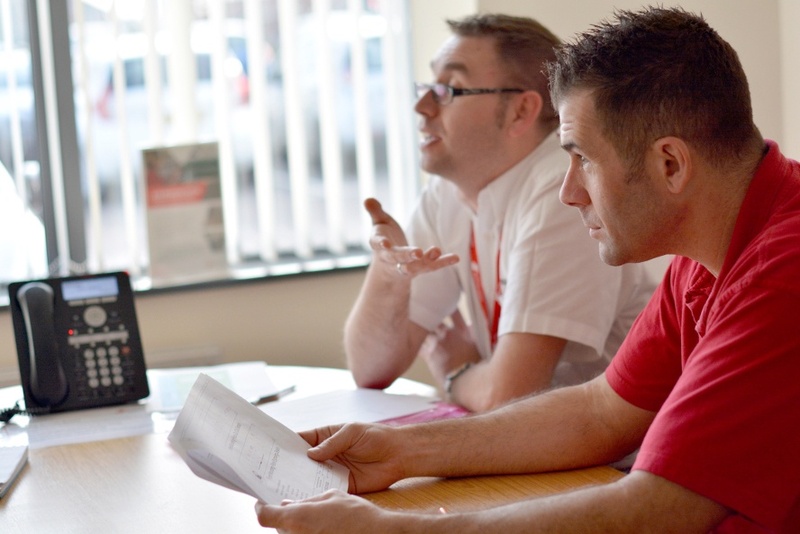 All JJS production staff are IPC trained and attend residential courses with the equipment manufacturers, as well as ongoing training and development. Build documents and machine programs are produced from customer’s CAD information using Aegis CircuitCAM processing software, with DFT/DFM advice given before committing to orders. This all results in process quality exceeding 5 Sigma. Advanced Ersa rework stations are available for product upgrades and repair of field returns. By assessing the above factors in detail, we can predict the defects most likely to occur in the manufacturing process. Our customers have boosted both the cost effectiveness and reliability of their end products, by taking this assessment into account. Since we offer an extensive range of test options, we will provide the most appropriate test strategy for your products. JJS Manufacturing's box build assembly and mechanical engineering capabilities are integral to our turnkey electronics manufacturing solutions. Complementing our PCB-level assembly services, JJS's box build assembly services are part of a comprehensive array of electro-mechanical assembly, cabinet assembly and full system integration services. Our customers take advantage of tailored, flexible, configure-to-order, system integration and test services. 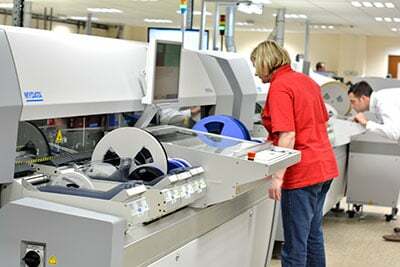 We have considerable expertise in setting up flexible "lean lines", in both our UK and Czech facilities. JJS Manufacturing can provide the right solution for your needs. Whether you need a simple product assembly - involving integrating a PCB into an enclosure - or a front panel assembly equipped with a display, full harness, connectors, switches, and fuses, etc. Also, going beyond the remit of a typical box build, JJS's engineering and manufacturing teams are experienced in the production of complex electro-mechanical "mechatronics" products. These are better described as machines rather than products. They require bespoke configuration; 19" rack sub-systems need to be assembled, and custom hard-wired cabinet assemblies delivered. In addition to producing and integrating custom PCB assemblies, we can also procure all necessary parts. These include pneumatics, PLCs, switches, timers, and encoders, etc. - plus plastics, custom metalwork, and machined products. From JJS, you receive a total manufacturing solution. We take you from sourcing, purchasing and supply chain management, through new product introductions and prototype production. And we establish agile assembly, configuration and test processes, to ensure that we maintain our world class performance levels for quality and OTIF delivery. 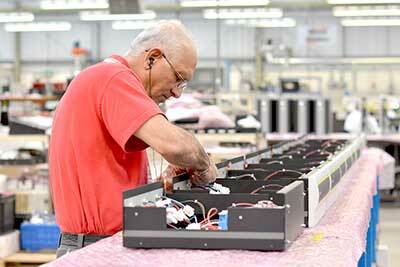 JJS Manufacturing's origins lay in custom cable and wire loom assembly. We have significant skills and expertise to bring to customers’ products. For OEMs requiring simple cable assemblies through to complex wiring harnesses, you can be confident that JJS will provide a high-quality service. With our dual facilities in the UK and the Czech Republic, we can manufacture a broad range of cable assemblies, from prototype to volume production. We also co-ordinate the entire supply chain and provide certifiable traceability. JJS has a breadth of experience gained producing simple point-to-point cables and straightforward looms, to multi-component assemblies and complex looms. We can process cable from 36AWG to 6AWG for use in demanding environments, including medical, surgical or high-end audio. We have highly trained engineering and assembly teams to assist with design and carry out the assembly and support for all your cable and loom requirements. Our dedicated build cells feature Schleuniger and Seno automatic cable cut and strip machines and are designed for low volume complex harnesses through to medium volume cable assemblies. We can accommodate various cable types, including coaxial - and have several automatic crimp machines for a host of manufacturers, such as JST, Harting and Amp. Cable assemblies are continuity tested, usually with Banair or Cirris automated equipment, before shipment or use in higher level assemblies. Whether your requirement is for a single single-ended wire or a full harness complete with connectors, switches and fuses, you can be confident that we will provide a high-quality service, right first time. JJS Manufacturing offers extensive experience in the provision and integration of wiring looms, 19" rack systems and control cabinets. From single or multiple panel rack systems, through to full custom control cabinet suites, we can deliver to precise customer specifications, in low to medium volumes. Our team uses customers' technical drawings and specifications to develop fully integrated rackmount solutions. A high level of accuracy means we capture every detail of your control cabinet configuration and hardware, so our service is ideal for multiple identical cabinet installations. We can also customise control cabinet enclosures with safety glass, mesh and steel ventilated doors. Customers can also select customised cable access and power management. 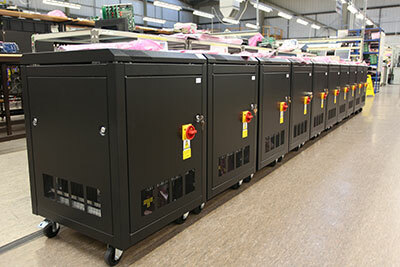 JJS Manufacturing delivers a broad range of options for customers requiring rack system development, from single front panel assembly, through to a full custom control cabinet. Renowned as a quality, "right-first-time" service, our rack systems expertise means we can procure all necessary components. Skilled, time-served wiremen use a vast array of cable preparation and crimp tools on both sub-rack and large cabinet projects. They work to customer drawings or build instructions produced in Solidworks mechanical and electrical CAD software by the experienced electrical engineering team. Metalwork modification is carried out in our machine workshop, and our testing comprises continuity, high voltage flash and PAT testing. We have proven track record in serving the following industries: transportation, industrial, telecoms, railways and renewable energy. Since 1983, JJS has been manufacturing complex electro-mechanical products on behalf of its customers. Our skill sets have continued to evolve. We feel that the full breadth of our precision mechanical assembly capabilities (often referred to as "mechatronics") is unique in our marketplace. We offer customers integrated contract manufacturing services for highly complex products. Before, these products were often seen as those that could not be outsourced. We produce many complex mechanical assemblies, which often feature a similar number of parts to a PCB assembly. These products demand high levels of skill, precision, accuracy and consistency. There is considerable in-house experience producing mechanical assemblies. They have such a high level of moving parts that we refer to them as "machines" rather than "products". The awareness of critical engineering tolerances and the use of mechanical tools and gauges is key when producing moving mechanical assemblies of this complexity. 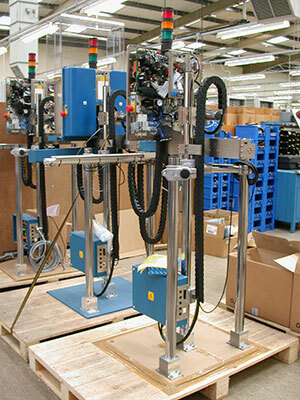 Our skills-base also extends to testing mechanical and pneumatic assemblies. Following rigorous approval processes, our supply chain partners for custom parts - such as plastics, machined and fabricated metalwork, etc. - are monitored for quality and delivery performance. Tight control of the material supply chain ensures that, as with electronic parts, the availability of high-quality mechanical parts is maintained for timely production. Interactive electronic documentation, dual-language work instructions and robust variant management controls are just some of the lean principles driving our quality-controlled production lines. We have considerable experience of establishing "lean lines", to produce complex mechanical assemblies. These assemblies can be resourced by between two and 10 operators, depending on live customer demand. We operate 24-hour replenishment through a line-side KanBan-based pull system, which is supported by bar-code tracking to provide real-time operational information. Many of the assemblies produced by JJS Manufacturing need wire and cable interconnection between boards and sub-assemblies. This can be via cable forms or point-to-point wiring. As part of our electro-mechanical assembly service, we are often called on to produce machines that require critical cable routing, so that the moving parts may function. We also undertake electrical wiring of switch and instrument panels, as well as sophisticated control cabinets. These are all essential requirements for many of our customers. This activity reflects the same standards of accuracy and consistency as our PCB and mechanical assembly work. 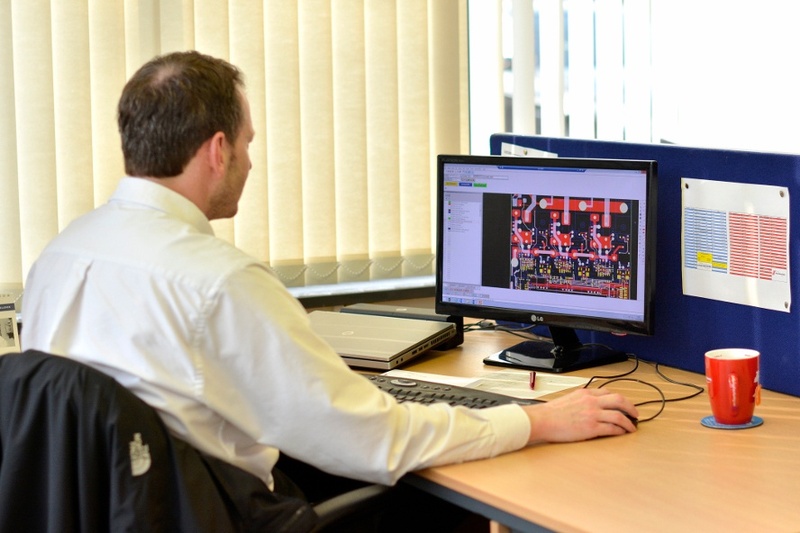 Control software upload, verification and execution is carried out within the scope of JJS's robust revision control system. JJS Manufacturing can provide historical records of hardware and software revisions for specific products and end users on request. We have proven, sophisticated, "lean line" manufacturing expertise. Coupled with our postponement manufacturing, configure-to-order (CTO) and outbound logistics (direct-ship fulfilment) capabilities, this means we can provide OEMs looking for a UK or CEE-based manufacturing partner with a robust solution. This applies even to the most complex, highly configurable,electro-mechanical products. Design for Test (DFT) sometimes called Design for Testability is the element of the design effort that focusses on ensuring that the required level of testability features are incorporated into hardware product designs in order to make it easier to develop and apply manufacturing tests. This is a critical process as PCB assemblies have become increasingly more complex and the ability to test these using traditional methods and systems has become more difficult. Therefore considering design for test in the early stages of product development is vitally important in order to ensure that adequate fault coverage and diagnostic ability is available. All of this contributes to improving the overall efficiency of the test process and reducing test times, and therefore overall product, costs and getting this right will have an important impact on the products viability throughout its lifecycle. JJS manufacturing has considerable experience in working with customers at this critical stage to help to ensure that their designs are optimised for the test processes that will be used downstream. Your products will be tested vigilantly by us, according to your needs. Benefit from the knowledge and expertise of qualified test technicians and engineers who are well versed in flying probe and in-circuit testing, in addition to being able to implement customer functional test solutions, complemented by conventional bench test equipment and XTJAG boundary scan. Flying probe testing is a popular solution for manufacturers working with smaller batch sizes. It is also frequently used when fixed test probe access is limited or impractical. A proven method of electronics manufacturing defect detection and prevention, flying probe testing also eliminates the requirement for dedicated fixturing. 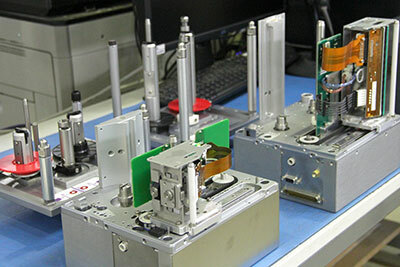 Flying probe testing uses a set of precision moveable test probes that directly access test points, vias, component pads, circuit interconnections and fine pitch parts. 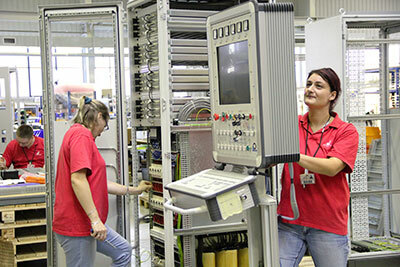 This means the technique is able to replace the need for a mechanical test fixture while also achieving test coverage similar that exhibited by in-circuit test (ICT). Although relatively uncommon in small to medium volume manufacturing, JJS offers full on-site in-circuit test, both analogue and digital, with vector-less test. Test fixtures and programmes are also produced on-site. For slightly larger volumes ICT is invaluable as a pre-cursor to functional test, reducing debug time and significantly increasing functional test yield. Boundary scan test is renowned as an extremely rapid test method, equipping manufacturers to debug and programme complex digital circuits. Our team uses cutting edge technologies from the likes of X-JTAG to deliver powerful Boundary Scan solutions. Ideal for testing boards populated with complex ICs, boundary scan processes deliver in-circuit levels of test coverage and diagnostics. Access purely from the board edge, this is an extremely useful and non-intrusive test technology. In addition, most modern devices feature bus technology which effectively creates thousands of test points to test components and interconnections. Boundary scan testing is the perfect way to identify structural fault locations, even beneath BGAs, without requiring mechanical access to the circuit. Functional test is a core component of the majority of successful test strategies. While it is often possible to de-skill functional testing, it is also often the case that functional test makes the highest demands on a skills base in terms of diagnostics. We have considerable expertise in designing and delivering efficient test and diagnostic solutions. Our experienced and highly qualified test engineers can develop functional test solutions in-house, or work with those provided by our customers. All functional PCB testing is fully supported by extensive engineering diagnostics so you can be sure that tested boards will be totally compliant with supplied specifications. To support the bespoke service level agreements we have in place for our clients, we offer a wide range of outbound logistics solutions to guarantee products are delivered on-time and in-full. You will benefit from our custom packaging solutions designed, with you, to guarantee the safe delivery of high precision electronic and electro-mechanical products. In addition to next day delivery, we can also satisfy your "same day shipment" requirements through our dedicated couriers. 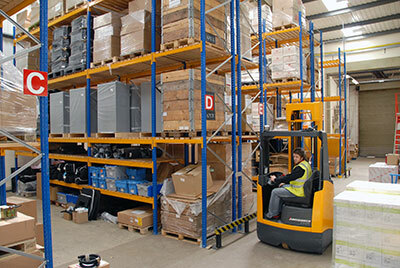 Alternatively, where increased levels of flexibility are needed - for instance, configured-to-order products or those that require shipping with spares/accessories, we have demonstrable experience in product marshalling and managing consolidated shipments to site. Logistics staff are fully certified in slinging and banksman duties, as part of our commitment to H&S and quality of shipping, should specialist crane deliveries of oversized control cabinets be required. For our customers, postponement manufacturing is the best way to meet demand forecasting challenges. With our late-stage configuration and configure-to-order manufacturing services, we ensure our customers can respond rapidly to opportunities, as and when they occur. This truly agile supply chain service harnesses our postponement manufacturing expertise and outbound logistics capabilities including direct shipment. For our OEM customers with highly configurable products, these late stage configuration and postponement techniques will alleviate demand forecasting challenges. Proven to deliver high levels of product differentiation and supply chain efficiency, the postponement of final product assembly until customer demand is clearly defined, means that our customers can react rapidly and more effectively to opportunities as they arise. Postponement manufacturing is a relatively simple theory, although its practice involves a high degree of collaboration and visibility throughout the supply chain. Our experienced team will manufacture a generic version of the product up to embryo level. We then hold this in inventory until the customer sends instruction to progress. The final product is then configured and packaged as appropriate, a process which is directly linked to customer demand. The postponement manufacturing process is highly responsive, enabling customers to rapidly configure different variations/options along with the appropriate accessories, packaging and instruction manuals for the product and the country it is being shipped to. JJS Manufacturing's configure to order or postponement manufacturing service is particularly attractive to customers wishing to take advantage of our CEE contract electronics manufacturing facility ideally located in Chomutov, Czech Republic which provides an agile gateway to Europe for our UK and USA-based OEM customers. To support the supply commitments you have in place with your customers, JJS can offer repair, rework, remanufacture, upgrade and modification services for your product lines. Whether you have a damaged unit out in the field, or have an entire batch of product that needs upgrading to the latest revision, we are able to create bespoke repair and rework agreements to meet your supply chain needs. Your product has not yet been sold to the end customer, but requires some modification or repair (e.g. a software upgrade was identified as being required whilst the product was being shipped).